Chelsea v Manchester City here. It is tense at Stamford Bridge. Spurs' manager Mauricio Pochettino: "I'm very pleased and very proud, it was a great performance, we played one of our best games since the beginning of the season. "This was a challenge, it's always difficult when you've gone to a final in difficult conditions and then be ready to play a tough side like West Brom. The key was to be focused, keep our concentration and our character was excellent." "We allowed them back in because at 2-0 up we were comfortable. With the wind and the conditions they had a real go in the second half. "Jon Walters was the star man and is a key player for us. He gives everything in every game and is a credit to his profession. It was his 200th game today and to get a hat-trick it is special for him. "Ryan Shawcross has had a back spasm but it was clear he was incapacitated and we had to bring him off." "We are trying and we need to fill one or two areas, we have to give us a chance in the last 15 games. We need one or two." Liverpool striker Daniel Sturridge: "It's an amazing feeling to be back playing and to help the team get three points. That's what matters the most, the team. Philippe Coutinho made my job easy. That's what he is best at, amazing assists and runs. In football players get injuries sometimes, but that's what the game is about. I'm grateful to God to be able to come back and help the team get three points. I'm looking forward to helping the team push on." Over on BBC Radio 5 live, 606 is in full swing and Jason Mohammad and Robbie Savage are taking your calls. Matthew, a Manchester United fan, says: "Angel Di Maria does not look like a player worth £60 million." Pat, a Nottingham Forest fan, says of Stuart Pearce: "His position is untenable, he has got to resign." While Robbie says Liverpool could finish in the top four now that Daniel Sturridge is back from injury. 3-1 win to get back within four points of La Liga leaders Real Madrid. "Raheem Sterling's game is coming along very, very nicely. Before he was put into that central spot I thought his finishing was poor, but he seems to have come to terms with that now and if he gets things right, he can be anything he wants to be." "We had enough possession and enough chances but couldn't find that bit of quality. "Going behind so early gave them something to sit on. They defended well, to be fair. You can't keep going behind because it's going to catch up with you and it did so today. "I couldn't have asked for more effort in the second half - they provided as much effort and commitment as you could hope for. "It's disappointing for our fans but they know and we know that there is a long way to go. We need to react well in the next game." "Harry Kane and Daniel Sturridge could form an England partnership. Kane is the most in-form England striker in the league by a long way. Today, Tottenham played some really good stuff, Eriksen was good again and Spurs weren't a static side. But credit to the keeper, who made some terrific saves at crucial times. And the difference was a superb free-kick from Eriksen and an excellent finish from Kane." Manchester United manager Louis van Gaal: "I'm very happy because of the positive result. We lost the last home match so we had to show to our fans that we are coming back again. "I liked my team in the first half. In the second half we tried to kill the game because we know what happened at Leicester when we were also 1-3 ahead and we lost the game. "But in the second half we played the ball too much backwards, and I do not like that as you always need to keep your eyes open for the pass forward. But we also have to learn to kill the game, we may have done that more than we wanted, but it is a learning process." Leicester manager Nigel Pearson: "It was a difficult game for us. We are playing against a very good side, to concede three goals in a really short space of time put us up against it. "The first goal is offside but I can't complain too much as we were beaten by a very very good side. "In the second-half we have at least shown a bit more resilience and managed the ball a bit better. I think that was our problem in the first half. On the next game against Crystal Palace: "Those are the games that are going to define our season, not necessarily games against the likes of Manchester United." "It was much needed. We knew Burnley would be hard-working. First and foremost we needed to match that, and we did. Then we needed to impose ourselves with quality. "The players on the pitch knew how important it was. We don't need to think we are ok - we need to go to the next level. "I knew that Jermain would score sooner or later because his qualities are there. I want this to be a turning point. I hope we will go into the next game with the confidence we were looking for." "The first half, the players know and I know that you can't give away chances at this level. Credit to Sunderland, two good goals from their point of view but two soft goals for us. "The lads have got total belief in what they do. We're trying to create, but we still need to find that quality at key moments. These are key reminders that you have to do everything right at this level." On striker Danny Ings: "He's a young man and a lot has happened in the last 48 hours. Speculation builds and people leak stories to the press. I must give Danny credit, he's dealt with it. Next week he'll be back with his team mates and he'll be full of beans again." Sunderland boss Gus Poyet on 5 live Sport: "I have a mixture of happiness and relief. We needed a performance and a victory like today, so it was very welcome. We knew Burnley and the situation we were in, so we needed to be very good with commitment, desire and a fighting spirit. And we needed to impose our quality, and when we did we created the chances. We kept a clean sheet and the two strikers who started today scored, so it's a perfect result for us." Over on BBC Radio 5 live, 606 has got underway. Lines are open and Jason Mohammad and Robbie Savage are taking your calls. Liverpool manager Brendan Rodgers, asked if he will be signing any players before Monday's deadline, tells Sky Sports: "No, I don't think anything will be done." Liverpool manager Brendan Rodgers on 5 live Sport: "It's been a really difficult time for Daniel Sturridge but a wonderful touch and finish, and a great goal for him. He's been working so hard. And I thought Sterling, Lallana and Countinho were all excellent today, and my two central defenders were strong. Overall, it was a wonderful team performance and another clean sheet." It is all happening at Stamford Bridge. Click on our live text commentary as Chelsea play Manchester City here to get involved. A goal at Stamford Bridge. Click here to follow our dedicated live text to find out who to. Stoke's hat-trick hero Jonathan Walters on 5 live Sport: "I've left my match ball in the changing room. A great result for us today, and it wasn't a pretty game as a whole. The conditions here were very windy and the pitch was boggy. We gave away a sloppy goal and for a while our backs were against the wall, but all over the pitch we were excellent and we competed for every ball. And now we move on up the league. "I think I'll get that match ball signed by all the players with a few little messages, and then I'll take it home and it'll probably end up in some cupboard somewhere!" Raheem Sterling on Twitter: "Massive three points. Great to see my boy Daniel Sturridge bag on his return." Jean-Louis Akpa Akpro's 77th minute strike gave Shrewsbury a 1-0 win at Newport County to keep his side top of the table - ahead of a hard-chasing Burton Albion on goal difference. Jimmy Floyd Hasselbaink's Burton, who have not lost at home this season, bagged a 1-0 win over Bury at the Pirelli Stadium thanks to Phil Edwards' second-half goal. They stay level on points with the Shrews. At the bottom, last-placed Hartlepool hung on for a 3-2 win over play-off hopefuls Plymouth Argyle, who are without a win in six games, but still remain seven points off safety. Devante Cole scored a brace as MK Dons thrashed Crewe Alexandra 5-0 to leapfrog Swindon and become the new league leaders. Dean Bowditch, Devante Cole and Daniel Powell got the other goals. Swindon not only lose top spot, but slipped out of the automatic play-off places after going down 2-0 against a Sheffield United side that pushed Premier League Tottenham all the way in their League Cup semi-final in midweek. Meanwhile, Crawley Town, who had gone 14 matches without a win, shocked promotion-chasing Preston North End with goals from Lee Fowler and Anthony Wordsworth securing a 2-1 win to move off the foot of the table. Some more breaking transfer news as Stoke City boss Mark Hughes confirms that defender Robert Huth is having a medical at Leicester. QPR's Harry Redknapp says he's not confident of bringing anyone in at the moment but will continue working until the end of the transfer window - surely there will be some late transfer drama for Harry? their game at Bayer Leverkusen bottom of the table. That's because Sport-Club Freiberg beat Eintracht Frankfurt 4-1 earlier this afternoon to climb five places. Marseille beat Evian Thonon Gaillard 1-0 thanks to a penalty from Andre-Pierre Gignac to move to within a point of Ligue 1 leaders Lyon. "It really does feel like the stakes are very high indeed here at Stamford Bridge, we've seen a number of mistakes from both sides already. Manchester City have had two clear chances so far, Fernandinho with the best of them when his shot was deflected wide of the Chelsea goal." separate live page. It has been a pulsating start. Hugo Lloris tells the BBC's Alan Green of his hopes for prolific Spurs striker Harry Kane, who grabbed goals number 19 and 20 of the season today. "When you're from the academy, you always get support from the fans. He works hard, wants to improve and he has a great mentality. I hope he gets a chance for the national team, he has a great future for Tottenham if he keeps up with his mentality." "I think Louis van Gaal will be most pleased with his countrymen. Daley Blind was superb, with two assists. And his forward, Robin van Persie, looked very good. But United are still not the finished article. It's OK, you can see the improvements, but there are more improvements to be made." Tim Krul: "Great three points, clean sheet and some fantastic goals in some difficult conditions.. Nice bus journey home now." James McCarthy: "Great three points from the boys! Tough place to go!! Roll on next week to the derby!" Atletico Madrid already lead Eibar 3-0 as even a dodgy pitch doesn't look likely to stop the champions closing the gap on La Liga leaders Barcelona. Mario Mandzukic helps himself to a quick-fire double to seemingly bank the points with less than half an hour gone. "I thought Darren was going to sign a contract. But at the end they look for a loan and that was not the agreement. "I'm only listening to what is now said by West Ham United. "I think so (he will remain a man utd player). He is my third captain so it is not a problem for me. Manchester United just want to help him play more. For him now that is a big pity." "Just spoke with Louis Van Gaal, appears to be stalemate over Darren Fletcher. He says #WHUFC want him on loan "which wasn't the agreement"." Liverpool manager Brendan Rodgers tells BBC Sport: "Daniel Sturridge is a top class player, he has shown that in his career so far. He worked very hard and the first opportunity that came his way he took. It was a wonderful pass by Philippe Coutinho. "We were obviously disappointed in midweek with the result at Chelsea in the Capital One Cup. We knew coming into today it was going be a tough game. West Ham have done great this season, but we had to win the battle and compete, fight and press. My players did that magnificently well. Maybe we could have had more than two goals." ...a draw and the gap will remain at five points. What will it be come the end of 90 minutes? On his assist: "I heard Robin van Persie screaming and I chipped it over and he scored it nice. "The runs of the strikers are very important, without that we have less options to give the ball." On playing in midfield: "I enjoyed today. I got some space to switch the play and pass forward. "For me it doesn't matter where I play, I can play in both positions. I prefer a little bit in midfield but if the trainer needs me to play on defence then I can do that." Manchester United's Daley Blind: "We are pleased with the result. We tried to keep possession and create chances from that. We were the better team, keeping possession and scoring goals. Once you score the first goal the other team has to do something. "We played a good game with a lot of patience and ball possession. The first-half was very good, in the second-half maybe we had too much patience. But we tried to kill the game with possession and create chances from that. "We come closer every week to the way Louis van Gaal wants us to play. We are on the right track and we are happy. "Of course you want a clean sheet but 3-1 at home, we played a good game and it is a good result." dedicated live text here. It should be a humdinger. Title-chasing Derby move level on points with league leaders Bournemouth as an own goal from Scott Malone and a strike from leading-scorer Chris Martin gave Steve McClaren's side a comfortable 2-0 win against a Cardiff team that are slipping towards the drop zone. At the foot of the table, Blackpool, who were rolled over 7-2 at Watford last weekend, secured a valuable 1-0 win over a Brighton side that gave Arsenal a scare in the FA Cup last weekend, thanks to Jamie O'Hara's left-footed strike. Lee Clark's side are still nine points off safety. Ricardo Fuller's late strike gave fellow strugglers Millwall a 1-0 win against a Nottingham Forest side that have lost six of their last seven games in all competitions. Ian Holloway's side need two more points to move out of the relegation zone. It appears the rain in Spain falls mainly at Eibar - judging by the pitch on which the Basque club are playing Atletico Madrid. lead 1-0 thanks to an early goal from France international Antoine Griezmann. Some more bad news for West Ham fans as boss Sam Allardyce reveals their move for Darren Fletcher is off. More on that when we have it. As if a 2-0 defeat at Liverpool isn't bad enough. A couple of late goals from Sheffield United to give them a 2-0 lead over Swindon Town. The Robins were top going into the day but, a defeat sees them drop behind new leaders MK Dons and Bristol City - who aren't in action until tomorrow. Just seconds to play at Bramall Lane. "It's a terrific feeling. When you come to Selhurst Park you need to be at your very best to keep a clean sheet. "The performance was just what was needed. It's a great feeling for the players. I hope that today can be a real kick-start in our season. "We created the best chances of the game. I thought we defended extremely well, it wasn't a fortunate win. "I thought Romelu [Lukaku] was quite infectious in the way he worked hard for the team. He gave everything." Atletico Madrid are able to win at Eibar to close within four points. A terrible weekend for the bottom four in the Premier League as they all crash to defeats. "The world will be watching Stamford Bridge today. There are 26 television crews and commentary teams from around the globe here at Chelsea, eclipsing the Premier League record of 19 when Manchester City played Manchester United back in 2012." Lfcway: One chance, one goal. Where would Liverpool be if Daniel Sturridge was fit all season? Stacy Phillips: And that's an 'unsharp' Sturridge. What a finish. He's back to his dancing ways already. James Arlett: Loving the irony. West Ham came out to play rough and ended up with three injuries! Muasya Musyimi: West Ham are slowly dropping down the league! Soon, chants of "Allardyce Out" will start filling the air, especially in Upton Park. Eamonn Driscoll: Kevin Nolan can't handle the pace at this level. Our stats with him playing versus not playing say it all. Liverpool striker Daniel Sturridge: "It's a team game and I am happy the team won. It's just good to be back. As I said, it is about the team's performances and us winning games. I have been watching on the sidelines and the lads have been playing really well but sometimes the results have not been going their way, but we have been working hard doing what the manger wants us to do." Daniel Sturridge is back for Liverpool and scoring - can they still get top four? They're only four points off and Robbie Savage thinks it's possible. Eleven away games and eleven defeats for QPR. How much pressure is Harry Redknapp under? Is Steve Bruce another manager under pressure? They've failed to score in ten of their last fourteen games and gave John Carver his first win as Newcastle manager today. And Harry Kane has scored twenty goals in all competitions this season, more than any other player - is there a more important player for their team right now? Lines are now open for 606 with Robbie Savage and Jason Mohammad - 0500 909 693, you can text 850 58 or we're @BBC606 on social media. "It was important that we got the win today. It was a massive win. We created a lot of chances today, the fans were fantastic. The energy from start to finish was fantastic today. We managed to get the early goal which helped us, settled us down. It's always difficult to be honest when you've had a long break. But I've had a mini-pre-season and I'm getting sharper and sharper. The Premier League is the best in the world and that's where you want to be. I feel like I have a lot of goals left in me. "The Premier League game of the season so far - and Chelsea will feel they would take a giant stride towards the title if they get the win that would give them an eight-point lead over Manchester City. "Chelsea manager Jose Mourinho has opted for Loic Remy instead of Didier Drogba in attack in place of suspected leading scorer Diego Costa, who is serving a three-match ban for stamping on Liverpool's Emre Can in the Capital One Cup semi-final in midweek. "Some surprise at the Manchester City line-up, which sees Bacary Sagna start and Pablo Zabaleta on the bench." John from Isle of Wight: Is this turning into one of the best Premier League seasons ever? The top seven teams are all beginning to produce real quality football. Neilio: Yes! Sturridge is definitely back! Two big games next, but the future's looking good. Marlo in London: Man Utd beating Leicester. The most expensive team in Premier League history beating the bottom club at home? When's the open top parade? Simon: Daniel Sturridge plays for seven minutes and gets a goal while Mario Balotelli has nothing since the season began. Mickey Somiah: Now people will give Brendan Rodgers a break. Had we not been robbed of Sturridge who knows? Great finish. Steevy Gee Sings: Seeing Sturridge back on the pitch is like seeing your child fly the nest for the first time - you wanna bubble wrap them up! Everton's free-kick deep in their own half. That should be that. Still time for Crystal Palace? Into the last few seconds. "Manchester United were the better team by a good distance, but it wasn't the kind of performance to get you into the top two. It was enough though, and now they can look forward to the cup game in midweek." "The win was never really in doubt, despite the fact that Higo Lloris had to make a few brilliant saves." "It may be to some extent second season syndrome for some of Roberto Martinez's players. Many of them are not having the season they did last season. But today is all about getting something from Selhurst Park. They are having to grind a result out against Crystal Palace. They are working very, very hard. I have seen them play some very nice football this season, particularly at home, but when you're not playing well you have to knuckle down. "For me, no-one is too good to go down, but if you look at the quality of Everton's squad relegation would be disastrous." Joey O'Brien heads into the net for West Ham but Kevin Nolan is clearly fouling goalkeeper Simon Mignolet. A perfect hat-trick for Jonathan Walters as he heads the ball into the net from 10 yards. Right foot, left foot and header. Surely that seals the win? "I know Everton manager Roberto Martinez mentioned his team as being in relegation trouble and I think they are. They had had one win in 10. Sometimes you have to spell out the real danger you are in. Martinez has done that, and he has good talent in his squad. He is trying to get his players focussed on what is ahead and there has been a reaction today." It looks set to be a good day for the league's bottom side Hartlepool as Scott Fenwick has made it 3-1 against play-off hopefuls Plymouth Argyle, who are are without a win in six games. Elsewhere, Northampton are that day's big scorers as Lawson D'Ath's brace has helped give the Cobblers a 5-1 lead at Accrington Stanley. Into stoppage time at Old Trafford and Leicester look completely out of fight now. Instead, Daley Blind goes for a fourth for his side, but his snapshot is held by Mark Schwarzer. Bobby Zamora rises unmarked for QPR in the penalty area but he misses the ball and it deflects wide for a goal kick. The clock is ticking. Flying stop from Palace goalkeeper Julian Speroni to keep out Aiden McGeady's left-footed shot from the right. Everton close to only a second clean sheet on the road in the league this season. There will be no hat-trick for Harry Kane as the Tottenham striker is replaced by Roberto Soldado for the final few minutes. "Harry Kane, he is one of ours" is the chant that rings out from the away end. They absolutely love him. Stoke surprisingly opt to not to make a wall for a QPR free-kick 25 yards out. Leroy Fer steps up and smashes the ball towards goal but goalkeeper Asmir Begovic does well to fling himself to his left and turn the ball wide. Ben Mee heads wide for Burnley but it was never really in danger of troubling Costel Pantilimon in the Sunderland goal. Time is running out for the visitors, with the Black Cats firmly on course to collect all three points. Carl Baker has made it 4-0 now to MK Dons at Crewe Alexandra and with Swindon still being held 0-0 at Sheffield United they will become the new league leaders. Elsewhere, Colin Daniel has pulled one back as Port Vale trail 2-1 at Barnsley and Tom Hopper has scored a brace as Scunthorpe, who will climb up to 16th, lead relegation strugglers Leyton Orient 4-1. Can QPR grab an equaliser? They have six minutes left to do so. This game has opened up after that Leicester goal as Marc Albrighton sends a dipping effort just over the bar for the visitors before Angel Di Maria brings a high ball under control and, with just Mark Schwarzer to beat, hooks his shot well over the goal. You get the feeling there is at least one more goal in this. Real Madrid a 4-1 lead over Real Sociedad. Everton close to a second as Aiden McGeady's cross narrowly evades Romelu Lukaku in front of goal. Crystal Palace still in this into the last 10 minutes. "I think Brendan Rodgers deserves a real pat on the back. Earlier this season he was under pressure, but he's worked and worked and has finally found a formula that suits his resources, his players. And that is where Liverpool's confidence has come from, especially their solidity at the back. All credit to the manager." "Daniel Sturridge does everything off that right leg, the one he has had problems with. There are no signs of problems now though. I know Liverpool have had to be cautious with Sturridge, but I wonder whether he could have played against Chelsea at Stamford Bridge. He could have been the difference." Close again for Liverpool. Raheem Sterling shows some more magic feet before having a low shot blocked by Adrian's feet. Daniel Sturridge scuffs the rebound wide. Liverpool are loving this. "It's Sturridge's finish that is fabulous. He doesn't panic, he's cool as a cucumber, and it's as though Sturridge has never been away. It's great to see him back on the field and it's great to see him finish like that." Ross McCormack has scored his fifth goal in five games to give Fulham hope of getting something out of their trip to Ewood Park but they still trail 2-1 to Blackburn Rovers, who might get a bit twitchy having gone five matches without a win. At the bottom of the table, Blackpool, who were rolled over 7-2 at Watford last weekend, have taken a 1-0 lead against a Brighton side that gave Arsenal a scare in the FA Cup last weekend. Jamie O'Hara with a left-footed strike. Almost a leveller for QPR and what a goal it would have been. Joey Barton stands over a free-kick 20 yards out, but his brilliant effort rebounds off the woodwork. It looks like Asmir Begovic got a very important fingertip to the ball. What a return for Daniel Sturridge. The England striker is played in by a precise pass from Philippe Coutinho and he fires emphatically home at the near post. No rustiness after five months out. Emphatic. Are Leicester back in this? Manchester United had been cruising to victory but they give Leicester hope as Marc Albrighton swings in a cross and Marcin Wasilewski is there to head in. Chelsea starting XI: Courtois, Ivanovic, Zouma, Terry, Azpilicueta, Ramires, Matic, Willian, Oscar, Hazard, Remy. Manchester City starting XI: Hart, Sagna, Kompany, Demichelis, Clichy, Navas, Fernando, Fernandinho, Milner, Silva, Aguero. It is job done as far as Sunderland boss Gus Poyet is concerned as he takes off goalscoring forwards Connor Wickham and Jermain Defoe for the final 15 minutes, Danny Graham and Steven Fletcher are on in their place. Better from West Ham. Stewart Downing's cross is deflected goalwards by Lucas, forcing goalkeeper Simon Mignolet to tip the ball over. The corner comes to nothing and, after a speedy break from Raheem Sterling, Daniel Sturridge's low shot is turned away by goalkeeper Adrian. Best chance of the game for West Brom as Saido Berahino spins round Federico Fazio and tries to sneak a shot in at the near post, Hugo Lloris claws it away before Danny Rose hacks off the line with Brown Ideye lurking. "Gus Poyet said let me go and buy the player I want and Jermain Defoe has come up with the goods today. But I would like to see Sunderland play a little bit more comfortably, instead of making hard work of games. It is vital they win against Burnley." "It's vital that Burnley keep Danny Ings if they are to survive, but it's almost certain he'll leave at some point. "Today, Sunderland have been excellent. If results stay the same, they go above West Brom. The Baggies are sinking, the Black Cats are climbing the table." Scott Dann is bandaged up and able to continue as Everton make their first change. Kevin Mirallas, after his penalty-snatching antics against West Brom, has had a quiet afternoon is replaced by Bryan Oviedo. The Toffees are soaking up the Palace attacks, with Seamus Coleman making an important clearance to snuff out an opening for Dwight Gayle. Opportunity for West Ham but Winston Reid heads a left-wing corner well, well wide. Leicester have a chance as Phil Jones sells David De Gea short with a backpass and David Nugent nips in. De Gea, not for the first time this season, stands his ground expertly to limit Nugent's options and the striker's shot is blocked by the United keeper. Play-off hopefuls Plymouth Argyle are behind again at last-placed Hartlepool thanks to Jonathan Franks' second goal of the game and the hosts could move within six points of safety by the end of the day. Meanwhile, Phil Edwards has given Burton a 1-0 lead against Bury as Jimmy Floyd Hasselbaink's side, who have not lost at home this season, look set to go top of the league. "The penalty scored by Harry Kane (16:21) was awarded because the ball hit Joleon Lescott's arm. Lescott's arm has to come up to counter-balance him, and I feel it's unfortunate, but it depends on what camp you are in on that one. Tottenham are looking strong at the back though. They've got a League Cup final to look forward to and there is a good feeling there." There'll be no Danny Ings goal today as he is taken off by Burnley boss Sean Dyche, Lukas Jutkiewicz replaces him but it is Sunderland who go close to adding a third as Connor Wickham drives a rasping effort over the bar. More claret spilled at the Palace as Scott Dann is now left with a cut above the eye after a clash of heads with Everton goalscorer Romelu Lukaku. As treatment continues, Wilfried Zaha is brought on for Martin Kelly. QPR are pushing for an equaliser at Stoke but are struggling to create anything of note. If they lose today, they will have made the worst away start in the top flight since 1953-54 when Liverpool lost their first 13 away games. Looking on the bright side, Harry Redknapp's side have got a way to go to break Manchester United's top-flight record: United lost their first 16 away games of the 1930-31 season, when they finished bottom of the table. There is a huge Anfield roar as Daniel Sturridge replaces Lazar Markovic. How he would love to mark his return with a goal. It has been a long five months for Liverpool fans - and for the player. Promotion chasing Preston North End could yet avoid a shock at last-placed Crawley Town, who have gone 14 matches without a win, as Paul Huntington has headed the visitors level. Swindon are still being held 0-0 at Sheffield United and will be leapfrogged at the top of the table by MK Dons, who lead 3-0 against Crewe. Karim Benzema making it 3-1 against David Moyes' side, whose first-minute lead seems a long time ago. Here comes Daniel Sturridge. The Liverpool substitute has his tracksuit bottoms off and his arrival looks imminent. Remember, he last played for the Reds on 31 August. My word is Harry Kane brimming with confidence, it oozes through in his penalty kick as he strokes the ball into the far corner, giving the West Brom keeper no chance. Better from Palace as Jason Puncheon's cross just evades on-loan striker Yaya Sonogo, who had got ahead of Phil Jagielka. The home team are beginning to build some momentum. They have come from behind to win in three of Alan Pardew's four games in charge. Can they do so again? Time for Carlton. Cole replaces Andy Carroll up front for the Hammers, after the ex-Liverpool man injures himself in fouling Emre Can. Enner Valencia goes close for the visitors with a low strike form an angle that is easy for goalkeeper Simon Mignolet. Leicester break through Leonardo Ulloa after a Manchester United attack breaks down. Ulloa charges into the area, he has Marcos Rojo for company and falls in the area with the United man in close attention. Ulloa screams for a penalty, nothing given and he smacks the ground in frustration. Andy Carroll is cautioned for a late challenge on Emre Can. It looked more like a slip than anything malicious but the striker has been totting up the fouls against. Title-chasing Derby look comfortable against a Cardiff side that are slipping towards the drop zone. Steve McClaren's side lead 2-0 - thanks to an own goal from Scott Malone and strike from top-scorer Chris Martin - and are currently on course for a seventh win in eight games to move level on points with league leaders Bournemouth. Meanwhile, Reading, who have put 11 goals past Sheffield Wednesday in their last three meetings at the Madejski Stadium, are leading the Owls 2-0 - Pavel Pogrebnyak and Nathaniel Chalobah with the goals. Quite a contrast to the start of the first half with little happening at Selhurst Park. Gareth Barry is trying to shake off a knock but Everton appear comfortable in the early stages of the second period, with Joel Robles easily catching a Joe Ledley free-kick. Eduardo Vargas's acrobatic scissor kick from the edge of the penalty area is parried away by goalkeeper Asmir Begovic. Still plenty of life in this game. That will teach you Jonathan Walters... The Stoke striker is making a nuisance of himself as QPR stopper Robert Green looks to clear. He ends up smashing the ball into Walters. Victor Moses is enjoying himself. The Stoke winger drives a free-kick from 20 yards just over the bar as Stoke start the half the better of the two sides. "Daley Blind has had a smashing game so far. He played a lovely ball for Robin van Persie to score the opener, and had a good hand in the third too. Manchester United haven't been stretched at all yet, but Nigel Pearson has changed his side to 4-1-4-1 formation, away from the 4-5-1 of the first half. Still there's only the one guy up front on his own. Andrej Kramaric has got a tough afternoon ahead of him." Adnan Januzaj is causing Leicester's Danny Simpson a few problems out wide and, not for the first time in this half, he gets free of the full-back and crosses low into the area, Radamel Falcao is there but Mark Schwarzer bravely clutches the ball at the striker's feet. "Raheem Sterling just bounces it off his chest, spins into the hole, and Philippe Cotuinho fins him with a lovely little pass. The only thing missing from Sterling's game is goals, and the way he put that away will really give him confidence." There have been a few publishing problems on the site over the last 30 minutes or so. The upshot of this is that some of the latest scores at the top of this page are out of date - our apologies for this and we hope to have the problem fixed soon. This afternoon's latest Premier League scores are Man Utd 3-0 Leicester, Crystal Palace 0-1 Everton, Liverpool 1-0 West Ham, Stoke 2-1 QPR, Sunderland 2-0 Burnley and WBA 0-2 Spurs. "Wonderful finish from Sterling but lovely build-up play. Liverpool opened up West Ham beautifully, and the finish from Sterling was fabulous." Have to admit, I love watching Christian Eriksen play - one of the most exciting players in the Premier League this season - and he almost creates something from nothing as he twirls on the edge of the area and shoots through legs but his bouncing effort is just wide. It had to be him. The brilliant Raheem Sterling chests the ball down to Philippe Coutinho, who slips the ball back through to the forward. Sterling, with just Adrian to beat, calmly slots the ball under the goalkeeper. Promotion-chasing Luton Town have extended their lead to 3-0 in their home clash with Cambridge and given that they have not lost at home since September look set to be moving to within a few points of the top three. Relegation-threatened Carlisle had the chance to leapfrog a Mansfield side that have just two draws from their last five outings with victory at home, but trail 1-0 to Vadaine Oliver's header just before the break. Leaders Wycombe are still being held 0-0 at home by Portsmouth. Sterling is at the heart of everything Liverpool are doing but, this time, he flashes a shot well over from 25 yards. Sunderland almost catch the Burnley defence sleeping as Patrick van Aanholt cuts the ball back for Jermain Defoe in the middle of the area, but the striker's first-time effort is held by Tom Heaton. Sublime stuff from Raheem Sterling as he jinks his way past a West Ham defender in the penalty area. He stands the ball up to Alberto Moreno at the far post but his volley is shinned the wrong way. Sterling has been a real handful. Leicester City make a change for the start of the second half, Esteban Cambiasso jogs on to the pitch, replacing Jamie Vardy. Could he be the man to kick-start a comeback? We shall see. Huddersfield defender Tommy Smith has been airlifted to hospital with 'major head or neck trauma' following his side's 2-1 defeat to Leeds earlier today. The 22-year-old suffered the injury as he tried to stop the winning goal from being scored by Billy Sharp. Tim (presumably not the same one): People can keep comparing Louis van Gaal with David Moyes on stats but Man Utd have only lost one in 14 in all competitions now. Moyes didn't have that stat at the Red Devils. So Van Gaal is very slowly building something at Old Trafford - thinks are looking up! "For 30 minutes until Newcastle scored there wasn't much between us but after that it was a cardinal of errors for the other two goals we gave away. "Once we made the mistake for the second one then it is an awful afternoon for us. On the handball: "It's a reaction, I'm not sure it's cheating, it's a reaction as it is too high for him to head. But the officials got it right and I'm glad to see that. Even though we are struggling where we are we don't want to score goals like that. "We have enough quality in the dressing room. When you have a tough time you need to know who you can rely on and unfortunately we are not doing enough." RogerDoesFilsm: If Leicester score five now I'll eat my phone. Khael Malik: How are the twitches, Louis van Gaal? Some reaction from the early kick-off where Hull's relegation worries deepened with a hammering at the hands of Newcastle. "It was very emotional at the end when I went over to fans. Not so long ago i was one of them and now I am in charge of this club. "It was a good away performance and there was not great deal between both side. I can take the pressure and deal with it and let the players go and express themselves. "Bobby Robson told me - if ever you get the opportunity don't be afraid of it and take it with both hands." No "welcome back" from Jose Mourinho for Frank Lampard as he returns to Chelsea with Manchester City today. Some very short and sweet programme notes end with a rather emotional: "I love this game, I love these players and I love this club. Come on Chelsea!" John Terry does not forget his old team-mate, however, saying: "Welcome back to Frank Lampard today, a Chelsea legend and a huge part of our history. In terms of consistency him, Petr (Cech), Dids (Drogba) are up there as the best I've played with at this club - he was brilliant for us, year after year, over the 13 seasons he had at Chelsea." MK Dons beat Crewe 6-1 earlier this season and a repeat could be on the cards as they now lead 3-0 at Gresty Road - thanks to two goals from Devante Cole and one from Dean Bowditch - and currently sit top of the league on goal difference with Swindon being held 0-0 at Sheffield United. Meanwhile, last-placed Crawley Town, who have gone 14 matches without a win, have taken the lead against promotion-chasing Preston North End thanks to Anthony Wordsworth's right-footed strike. they would move off the foot of the table as it stands. Gary Clark: 3-0 to Manchester United, but Leicester may score five again yet! Lucian Popusoi: He threw an elbow in that first half, did Andy Carroll. Imagine if it was Costa doing that - the pundits would have had a field day. Be fair. Jordan Mundy-Gill: I love Christian Eriksen. Always had potential but fast becoming one of the best players in the league. Jay: Louis van Gaal has lost the plot. Playing 4-4-2? Phil Jones not taking corners? Angel Di Maria not playing up top? What's happening? Crystal Palace have pushed for the equaliser and will consider themselves a little unfortunate to be behind. "Niko Kranjcar's goal's gives QPR hope in the second half. Will their terrible away run end in this match?" Niko Kranjcar's goal has given QPR a lifeline with their only meaningful effort of the first half. "Manchester United almost didn't have to break sweat. Leicester never came out, and although United tailed off for a 20-minute period or so, eventually the amount of possession the home side had paid more dividends than expected. I cannot see any way back for Leicester right now." "Highly satisfactory first half for Tottenham, with three attempts on goal but two going in the net. They have also had to thank goalkeeper Hugo Lloris, who has been outstanding. Spurs are in charge for the moment." Half-chance for Palace debutant Jordon Mutch but he skies his shot with five minutes of stoppage time to be played after Chamakh's earlier injury. "Sunderland now have to keep the ball. They have to have a calmness to make sure Burnley don't get back into it. These are difficult times and it is really important they keep going at the Burnley defence. They don't want nervousness to become a factor." Half a chance for Burnley as Ashley Barnes has sight of goal, tries his luck but it is easy pickings for Costel Pantilimon. The hosts have been on top but, despite some brilliance from Raheem Sterling and Philippe Coutinho, have lacked the final bit of quality in front of goal. Daniel Sturridge anyone? Lazar Markovic blazes wide with just West Ham goalkeeper Adrian to beat, after Raheem Sterling goes down a little easily under the challenge of Joey O'Brien in the penalty area. "A few minutes ago Daley Blind got his head to a corner at the near post, he is there again and this one was perfectly timed. Because of the ricochet off of Wes Morgan it was almost impossible to stop." "Wes Morgan got the last touch. The ball's right in the six yard box and Morgan doesn't see the ball until late. It strikes him and goes in. In my career I was on the end of a few drubbings, and when you face that team again you want payback. For Manchester United today, this is revenge for that defeat on the first game of the season." Title-chasing Derby, who have won six of their last seven games in all competitions, have taken a 1-0 lead against out-of-sorts Cardiff thanks to an own goal from Scott Malone and have moved level on points with league leaders Bournemouth. Wolves' lead at Bolton didn't last too long with Zach Clough scoring two goals in two minutes to give the home side, who drew 0-0 with Liverpool in the FA Cup last weekend, a 2-1 lead against their play-off chasing visitors. Meanwhile, Pavel Pogrebnyak has given Reading a 1-0 lead at home to Sheffield Wednesday. Real Madrid now lead 2-1 against Real Sociedad with Sergio Ramos putting the La Liga leaders ahead eight minutes before half time. Surely game over at Old Trafford as Manchester United add a third. This time, Daley Blind heads on a corner and Leicester's Wes Morgan can do little as it hits him on the head and deflects into the back of the net. It is all too easy and United are going up to third as things stand. Promotion-chasing Luton Town haven't lost at home in the league since early September and look like maintaining that record with Andrew Drury firing them into a 1-0 lead against Cambridge - who held Manchester United to a 0-0 draw in the FA Cup. Play-off hopefuls Plymouth Argyle are without a win in six games and fell behind on their 700-mile round trip to struggling Hartlepool, but Ryan Brunt has cancelled out Jonathan Franks' opening strike to make it 1-1. Leaders Wycombe are being held 0-0 at home by Portsmouth. Blow for Stoke as central defender Ryan Shawcross limps off to be replaced by Marc Muniesa. QPR might fancy their chances at getting at Stoke. "QPR have got a goal back and you could say they are back in this but Stoke have been controlling things and QPR were quite fortunate with the goal really in the way it fell to Niko Kranjcar. Harry Redknapp is struggling to find a system that works at QPR and Kranjcar is just playing off the strikers." Liverpool continue to press but can't find the final touch. Raheem Sterling races down the left, cuts inside, but his shot is blocked by Adam Lallana. West Ham keeper kicks out at Philippe Coutinho but, fortunately for him, doesn't make contact. Daniel Sturridge will be itching to get involved on the substitutes' bench. "I don't think Burley have the financial resources to replace Danny Ings if he leaves. But if Burnley do go down, the manager will keep his job. At that club it's all about managing the finances." Real Madrid are being held 1-1 by David Moyes' Real Sociedad at the Bernabeu Stadium in a 15.00GMT kick-off. Gorka Elustondo put Sociedad ahead in the first minute but Real, missing the suspended Cristiano Ronaldo, levelled through James Rodriguez. West Brom have suddenly come to life and go closest to pulling a goal back when Craig Dawson rises to meet a James Morrison free-kick, but plants his header on the top of the crossbar. A goal for the Baggies before the break and things could get very interesting. Jason Puncheon with a fierce drive from 25 yards that Joel Robles turns around the post. Palace continue to dominate after falling behind in the second minute. "Defoe's going to score goals in this league, there's no doubt about it. And Gus Poyet's new signing has delivered - he has every reason to be delighted on the touchline." QPR are back in it. Joey Barton does well on the right and squares to Charlie Austin in front of goal. The striker scuffs his shot but Niko Kranjcar is in the right place to tap home. Game on. Andy Carroll has already had an eventful return to Anfield after being at the centre of a couple of controversial challenges. The West Ham striker goes close to breaking the deadlock with a close range header that forces a save from Simon Mignolet. Jermain Defoe is up and running in a Sunderland shirt as he grabs his first goal since joining the club. Patrick van Aanholt draws out Burnley keeper Tom Heaton and crosses for Defoe, who pokes in from close range. Where is QPR's defence? Jonathan Walters plays a one-two with Stephen Ireland, before slotting in his second goal of the game from the edge of the penalty area. Stoke are having a field day. "Radamel Falcao is claiming he had the last touch, although there may have been a deflection onto him from the Leicester defenders trying to clear it. Manchester United were in too easily there - there is just not enough pace in the Leicester back four. Leicester are going to have to come out and really play to get back into this. But they have done it before against United..."
Andy Carroll is certainly making Liverpool aware he is around. This time Lazar Markovic goes down holding his face under the aerial challenge of the striker. Didn't look to be much in that. 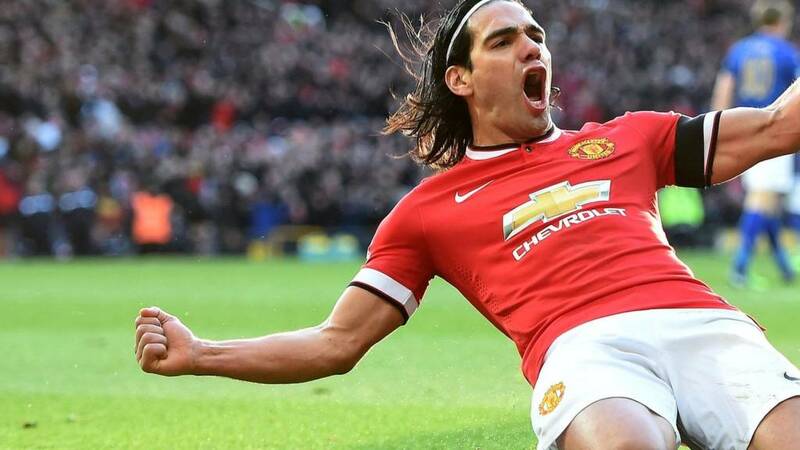 Manchester United have burst into life and Radamel Falcao adds a second with the simplest of tap-ins. Robin van Persie charges at the Leicester defence before slipping the ball to Angel Di Maria, whose drive is swatted away by Mark Schwarzer, but Falcao is there to stab in. Signs of life at last from the hosts, with James Morrison's curling shot from just outside the box bringing a fine one-handed save out of Hugo Lloris, who then makes an even better stop low to his right to deny a close-range stab from Claudio Yacub. "Robin van Persie was not offside, I don't think. All of Leicester's defenders stood stock still. Lovely play from Daley Blind in the build-up, who stole the ball before playing Van Persie in. And a great finish." Devante Cole's 12th minute strike has put MK Dons top of the league for the time being as they lead Crewe 1-0 at Gresty Road and Swindon are being held 0-0 at Sheffield United. Last-placed Crawley Town, who have gone 14 matches without a win, have taken the lead against promotion-chasing Preston North End thanks to Anthony Wordsworth's right-footed strike. they would move off the foot of the table as it stands. "Just seconds after I suggested Manchester United weren't creating anything at all they go and score. But there are some looks of daggers being thrown by the Leicester defenders towards the assistant referee, and on the replay Robin van Persie looks well offside. Leicester were taking a chance with a high line and were caught, but I think it is offside." This game had 0-0 at half-time written all over it until a lapse of concentration from Andrej Kramaric and a brilliant finish by Robin van Persie. Kramaric dithers in possession, Daley Blind steals the ball and clips a pass for Van Persie, who peels away from the defence and drives in. A delay in play at Selhurst Park as Marouane Chamakh is stretchered off after a clash of heads with Seamus Coleman leaves the Palace striker with a bloody nose. Bad luck for Chamakh, who was making his first league appearance for six weeks, as he can't continue and new signing Jordon Mutch comes on to make his debut. Almost a stunner from Victor Moses for Stoke. He bends a 25-yard free-kick towards goal but it just goes the wrong side off the post. QPR aren't in this. "Fabulous finish from Harry Kane (see 15:14). He gets better and better." Ben Marshall's right-footed strike has given Blackburn a 1-0 lead over Fulham in their mid-table clash - Rovers have gone five matches without a win.